Housing Authorities De-Lead 40 Apartments and Produce Only 1 Drum of Waste | Pentek, Inc.
Public Housing Authorities (PHAs) are taking charge of their lead-based paint problems, and working to determine how they can best comply with mandates from Congress and HUD to remove lead from the housing units they manage. The best managed Authorities begin with a thorough investigation of the different methods of lead abatement currently available. Usually, several techniques are demonstrated before choosing the most effective method, including caustic pastes, abrasive blasting and power tool cleaning. In case after case, PHAs who have compared all the available methods have selected Pentek’s dustless power tools as the best alternative, and have included a system in their de-leading specifications. Pentek’s method of dustless decontamination has now been used to abate more than 1,000 housing units in PHAs throughout the country. Officials from the PHAs and the contractors performing their lead abatement work report Pentek’s tools to be highly effective in removing lead-based paint and controlling the lead dust hazard. 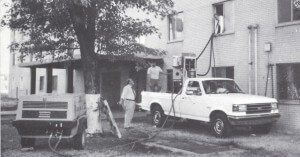 The Lexington-Fayette Urban County Government in Kentucky began lead abatement efforts with the Pentek system in the fall of 1991. This local government organization is contracted by the Federal government to remove lead and asbestos from public housing in the area. The portable Pentek system cleans the complex surfaces of a door frame. After attending a demonstration at Pentek’s facility near Pittsburgh, Lexington-Fayette purchased two complete Pentek systems, including VAC-PAC® Model 9A vacuums and several Corner-Cutter® scarifying tools for lead and asbestos removal. 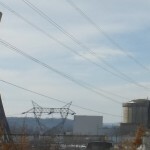 Started in September of 1991, this project is expected to last 18 months. A total of 1,300 units are slated for lead removal from door frames, window lintels, and stairwells. Sixty units were completed during the first two months of the abatement effort. Lexington-Fayette expresses satisfaction with their equipment, and particularly like the work the Corner-Cutter® does on window lintels. The equipment removes paint and red-lead primer without airborne contamination. All airborne and wipe tests have come back clean. After realizing their housing complex had lead-based paint problems, the Norfolk Housing & Redevelopment Authority in Virginia performed several tests to determine the most effective abatement method. Pentek’s dustless needle gun system was selected for the project over caustic pastes and vacuum blasting. The Norfolk PHA selected a contractor who had previous I experience using Pentek’s equipment in lead abatement at the Norfolk Naval Shipyard. 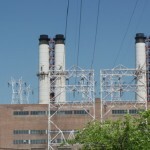 The Navy had selected the Pentek system for lead abatement work a year earlier, after an extensive testing program which included time-motion studies and exposure monitoring of workers and the environment. Pentek is frequently asked to demonstrate the effectiveness of our system by public housing authorities (PHAs) around the United States. Pentek is pleased that so many PHAs are expressing a serious commitment to lead-based paint removal, as exhibited by their willingness to investigate Pentek’s unique dustless decontamination system for lead removal. These housing authorities recognize that any meaningful demonstration of a lead abatement technique requires testing and support, thus they are willing to share costs and devote their time and resources verifying the system’s effectiveness. Some of the PHAs which have conducted their own investigations of the performance of Pentek’s equipment include: Newport News, Virginia; Cambridge, Massachusetts; and Chicago, Illinois. 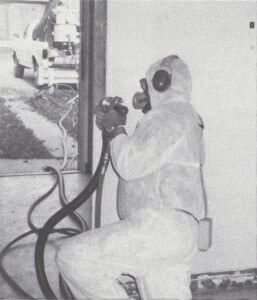 Subsequent to the demonstration of Pentek’s equipment, all three of these housing authorities included dustless needle guns in their lead abatement specifications. Recently, Pentek performed a demonstration for the Cuyahoga Metropolitan Housing Authority, where the dustless performance of the Pentek system was again confirmed by personnel and area air monitoring. Cuyahoga was particularly interested in the potential waste reduction benefits afforded by the Pentek system. A recent lead abatement project performed using caustic pastes generated nearly 50 drums of hazardous waste to de-lead only 50 apartments, at a cost approaching $50,000. The Pentek system would generate less than two drums of paint chips to delead the same apartments. Demonstrations typically begin with a brief explanation of the equipment before beginning the actual removal of lead paint. The Corner-Cutter® is then used to remove lead-based paint from a test area, which generally includes a door frame, a window lintel or a stairwell. The lead dust and debris removed by the Corner-Cutter® is simultaneously collected by the VAC-PAC®. Air samples taken during the demonstration often contain no discernible lead, and have never shown airborne contamination anywhere near HUD or OSHA limits. Wipe tests on door frames at the Chicago Housing Authority yielded surface lead concentration of only 20 µg/ft². Similar wipe test results were obtained from window lintels in the Cuyahoga Metropolitan Housing Authority, even before performing the TSP wash on the surface recommended by the HUD Interim Guidelines. Demonstrations give housing authorities the opportunity to view Pentek’s equipment and see how it works in their own environment. Pentek’s fully trained hazardous waste technicians can provide on-site demonstration of the equipment on lead-containing paint with the PHA’s support. Pentek also demonstrates the equipment free of charge at our facility near the greater Pittsburgh International Airport. This allows the opportunity to observe the equipment and accessories at work, and to ask questions of the entire Pentek staff. Up close and safe, officials examine the benefits of increased accessibility to the work area made possible by elimination of environmental enclosures. The Portsmouth PHA in Virginia began its research into methods of effective lead abatement efforts by consulting neighboring PHAs about their experiences. The Portsmouth PHA, hearing of the successful abatement efforts at Norfolk Housing Authority, specified Pentek’s system, then contracted with Bar, Inc. of Newport News, Virginia to perform the abatement work. Bar began the remediation effort at Portsmouth using Pentek’s VAC-PAC® Model 9A and several Corner-Cutters®. According to Rayfield Grant of Bar, the Corner-Cutters® are efficient; one Corner-Cutter® completely and effectively removes paint from a window lintel in one and one-half hours, inside and out. In two hours, a door frame can be completed. Set up of the Pentek system is simple, and containment requirements are reduced, so workers are on the job in about 15 minutes of their arrival each day. All the equipment goes back to the shop each night, eliminating security concerns. Bar recently finished removing lead-based paint from window and door frames in Portsmouth’s 450 units. According to Bar, one 55 gallon drum of waste was used for every 40 units that were remediated. In contrast, the Cuyahoga Metropolitan Housing Authority informs us that de-leading using caustic pastes generates almost one drum of waste for each apartment. A waste hauler in the Virginia area commented that some of their customers had hoped the use of caustic pastes would allow their waste to be disposed of in sanitary landfills. However, most landfills refuse the combination of lead and chemical waste, even if it is not hazardous under EPA guidelines; so it all has to go to a hazardous waste landfill anyway, at a much higher cost. Bar has completed several projects using Pentek’s system. Recently, they purchased additional Pentek tools for an increased number of contracts in lead abatement, including lead-based paint removal for the Newport News Public Housing Authority.